A policeman and a former policeman have been arrested in Brazil in connection with the murder of eight men at a football fan club in Sao Paulo. The former policeman, named as Rodney Dias dos Santos, is the alleged mastermind of last month's attack. Supporters of the Corinthians club were preparing banners ahead of a match when gunmen burst in, police said. Police say the killings at the Pavilhao Nove supporters' group were likely to be drug related. The attackers ordered seven fans to lie down before shooting them. The eighth man was hit as he tried to flee. Rodney Dias dos Santos and the other man, who has not been named, were arrested on Thursday morning and taken into police custody, according to O Estado de Sao Paulo newspaper. 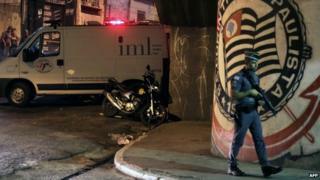 Witnesses say three gunmen stormed into the makeshift club in a working-class suburb of Sao Paulo on Saturday, 18 April. Sao Paulo police suggested the Pavilhao Nove group may have had links to criminal gangs, saying the killings were probably more to do with a dispute over drugs trafficking than with football. Violence in Brazilian football is a growing problem both directly and indirectly, with supporters of teams in several major cities using their club allegiances to organise criminal activity outside the stadiums, the BBC's Wyre Davies reports from Rio de Janeiro. The victims were having a barbecue as they prepared for a Corinthians' match against their fiercest local rivals, Palmeiras, the following day. Corinthians are one of the Brazil's most popular clubs, followed by millions of supporters across the country. Rivelino, Socrates and, more recently, Carlos Tevez and Ronaldo, are among the big names who have played for the club.